Diuretic Extreme By CTD Sports, 80 Caps at SameDaySupplements.com® for lowest price. 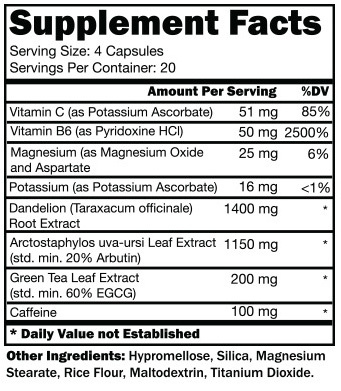 What Is CTD Sports Diuretic Extreme? How Does Diuretic Extreme Work? What's In CTD Sports Diuretic Extreme? How Do I Take CTD Sports Diuretic Extreme? Take four (4) capsules of Diuretic Extreme after your morning meal, and four (4) capsules of Diuretic Extreme after your mid-day meal, along with 16 fluid ounces of water. Drink at least 6 to 8 glasses of water daily. Consult your health care provider before consuming this product. Do not use if you are pregnant or breastfeeding. Not intended for use by persons under the age of 18. DO NOT EXCEED RECOMMENDED DOSAGE. We have a large selection of in-stock CTD Labs products including Diuretics items and others for the lowest prices at SameDaySupplements.com® It's always easy to shop for Diuretic Extreme By CTD Sports, 80 Caps at SameDaySupplements.com because you can browse by reviews, brand, prices or search for specific ingredients using our search tool. In-stock orders placed before 3pm EST ship out the same day to USA, Brazil, United Kingdom, Canada, Germany, Australia, Japan, India, France and worldwide at the cheapest prices online.